New York Mets staff ace Matt Harvey and top pitching prospect Zack Wheeler delivered back-to-back impressive starts in a doubleheader on Tuesday against the Atlanta Braves, leading the Mets to victory in both contests. In game one, Harvey was electric, bringing a no-hit bid into the seventh inning before surrendering an infield single to Jason Heyward with no outs in the top of the frame. Prior to Heyward’s single, Harvey had retired 10 straight batters and struck out a season-high 13 batters heading into the eighth. However, the eighth would read a different story. Harvey would load the bases to begin the inning, wherein he would be pulled from the game and replaced by LaTroy Hawkins, who would surrender a two-run double to Jordan Schafer and an RBI single to Heyward. In all, Harvey had a strong outing, working seven innings and surrendering three runs on three hits, while striking out an impressive 13 batters and walking three. As for Wheeler, the Mets’ top pitching prospect would be making his major league debut in game two of Tuesday’s doubleheader. Wheeler was both impressive and sharp in his debut, showcasing a four-seam fastball that consistently sat in the high-90s throughout the evening, reaching 98 MPH on occasions. His fastball had good sinking action, while his curveball-slider off-speed combo was sharp, as he generated a good amount of swings-and-misses with his diverse, yet plus pitch arsenal. Although he struggled with control issues early on in the game (surrendering five walks in the outing), Wheeler pitched like a seasoned veteran for the majority of the game, going six scoreless innings and striking out seven batters in a 6-1 victory for the Mets, wherein he would garner his first career victory. 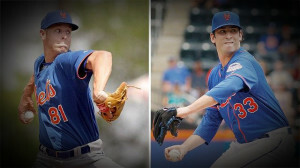 Mets fans got a glimpse of their future 1-2 punch, as Harvey and Wheeler looked impressive on the mound in back-to-back victories for New York. If Tuesday was any consolation, the Mets have much to relish in the future, as Harvey and Wheeler project to be a formidable duo at the top of the rotation for years to come.